Browse all our gift ideas like these nautical pilsner glasses. We've sought out some nautical gift ideas that are sure to please any boating enthusiast. If you have a co-worker, neighbor, spouse or any friend or family member with a passion for the boating lifestyle, you will be sure to find the perfect gift from among our selections. Our guide includes unique nautical drinkware, fishing trips, life-saving boating gadgets, products personalized with a boat name or a local nautical chart, and more. No gift guide is complete without a selection from BoatNameGear. If you know the boat's name of the person you're shopping for, then BoatNameGear can make your life a lot easier this holiday. 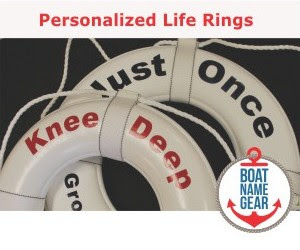 With fast shipping, no minimum order size requirement and no set-up fees, BoatNameGear is our choice for boat name gifts. We recommend BoatNameGear’s sporty polo shirts, embroidered with a boat name on the left chest, and your choice of an image such as a boat, lighthouse or ship’s wheel. Add a personalized jacket or sweatshirt for those cool evenings on the boat or even for wearing when they're not on the water! They also carry personalized Turkish towels, life rings, welcome mats and more! Shop now and use promo code DAILY at checkout to receive 10% savings on any order, plus free ground shipping on orders over $100 at BoatNameGear. No, we're not asking you to give blood (of course, if you do want to do that, there's no time like the holiday season). What we are asking you to do is consider a gift that could save a boater's life! With a patented, compact, wireless Autotether device clipped on his shorts, your beloved skipper will be safer than ever when out on the water. If he or she ever falls overboard, Autotether automatically shuts off the engine. It can also set off an alarm in the event that passengers (or pets) wearing the Autotether personal sensors on the boat fall into the water. Seriously, this is the perfect gift for people that are safety-conscious, or who enjoy boating with kids or pets. SeaSquared Charters has collaborated with Florida Keys artist Joey R. Smith to help you preserve your fishing and vacation memories for a lifetime on an original piece of nautical artwork! Joey will print your photograph from your fishing trip with SeaSquared Charters (or a picture from any vacation) with archival pigmented inks on heavy-weight, high resolution canvas. He then surrounds the custom canvas with a hand-made frame made of weathered lobster trap wood that is original to the Florida Keys. This is a unique gift that could be made even more special if packaged with a gift certificate for a Florida Keys fishing vacation with family and friends from SeaSquared Charters. These pilsner glasses are perfect for both the boat and the beach house with their bright colors and big nautical symbols etched into the side. The designs include a red crab, navy blue marlin, silver anchor and a gold ships wheel. We love the colors and design, of course, but we especially appreciate their large 20 oz. capacity! You'll find these glasses along with many other items to compliment your special beach house nautical table at Caron's Beach House. And if you join Caron's Beach Club (i.e., sign up for their free newsletter), you'll get 10% off your first order! 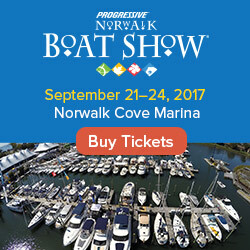 If you come across any other unique holiday gift ideas for boating, fishing or beach enthusiasts, please comment below to let us know. SailorBags is offering 25% off site wide! A great deal on nautical styled bags, totes and accessories made from real sailcloth. Visit www.sailorbags.com to ship now.